On October 22nd, 2015, President Obama met with the Marshall Project, as well as a new group called the Law Enforcement Leaders to Reduce Crime and Incarceration. 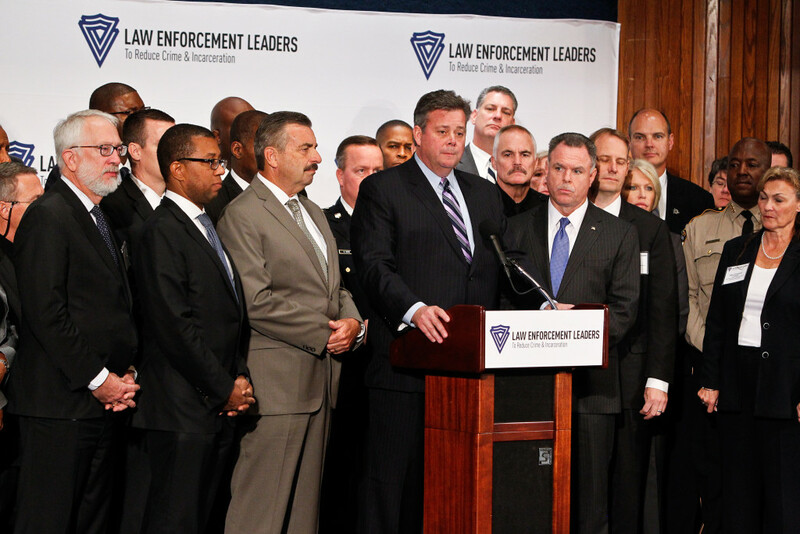 The new group is made up of 130 police department heads and law enforcement officials, including William J. Bratton of the New York City Police Department, Charlie Beck of the Los Angeles California Police Department, and the Chief of Police of Chicago, Garry F. McCarthy. Prior to their launch event on October 21st, the group issued a Statement of Principles, concerning the incarceration rates in the United States. In the Statement they wrote: “…too many people are behind bars that don’t belong there.” The group has encouraged a public debate on the policy considerations of incarceration. The group encouraged the modification of legislation to reduce mandatory minimum prison sentences. Congressional Democrats and Republicans also pressed to reverse the public policy of the last 40 years, which substituted heavy prison sentences for a public policy dealing with narcotics addiction and mental health issues. Reflecting on the fact that narcotics addiction is a driving force in incarceration rates, the group has spoken out for consideration of alternatives to prison sentences for substance abuse. Prosecutors have unfettered discretion in framing charges for violations of law. In its Statement of Principles, the Law Enforcement Leaders group included a comprehensive catalog of studies showing more than one third of the prison population came into the system with significant mental health or substance abuse problems. The Law Enforcement Leaders group said they would lobby the United States Congress and state legislatures to reclassify nonviolent felonies as misdemeanors and move to reduce a number of petty offenses from criminal statutes throughout the nation.These changes will allow public officials to refocus resources to deal with community issues in addressing criminal defendants. In a local note, the Law Enforcement Leaders group pointed to the Miami’s Eleventh Judicial Criminal Mental Health Project program as an excellent example of public policy modifications that address the broader spectrum of mental health and substance abuse issues presented by those arrested for property and nonviolent crimes in Florida. The program has allowed the city to close one of its jail facilities to reflect a reduction in nonviolent arrest resolving with jail terms. The ongoing program helps train police agencies and prosecutors in Florida to deal with the issues of substance abuse and mental health concurrent with arrests for nonviolent and property crimes in the Miami area and been an encouraging example to other states.